Flagstones are large flat, loose pieces of stone commonly used for outdoor paving projects such as patios, pool decks, stairways & driveways. 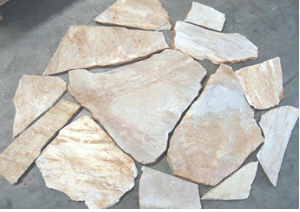 They are irregular in shape and vary in thickness and are very good value because they are basically off-cuts. In Australia, flagstones are commonly known as "crazy paving" probably because the stone pieces come in crazy shapes and sizes. 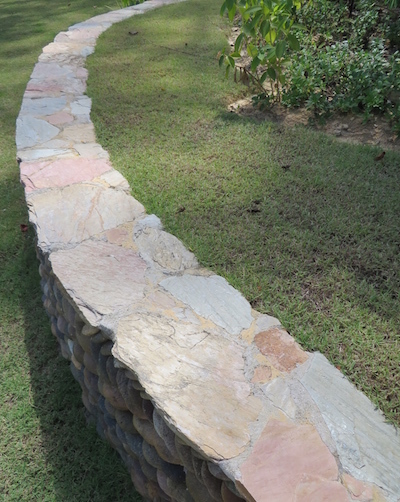 Flagstone pieces are variable in size and thickness. They are packed in layers in crates about 1 square metre in area. We estimate that each layer once fixed will cover 1m2 in area but this will depend on the width of joints used. Thickness estimates: Sandstone 10-30mm; Quartzite 12-35mm; Slate 15-50mm. Landscapers love flagstones because they are so ad hoc which makes them beautiful building blocks for their artistc natures. They really suit winding pathways and circular outdoor paved areas because their random size suits curves - just the opposite of square or rectangular shaped pavers that have been through a factory.